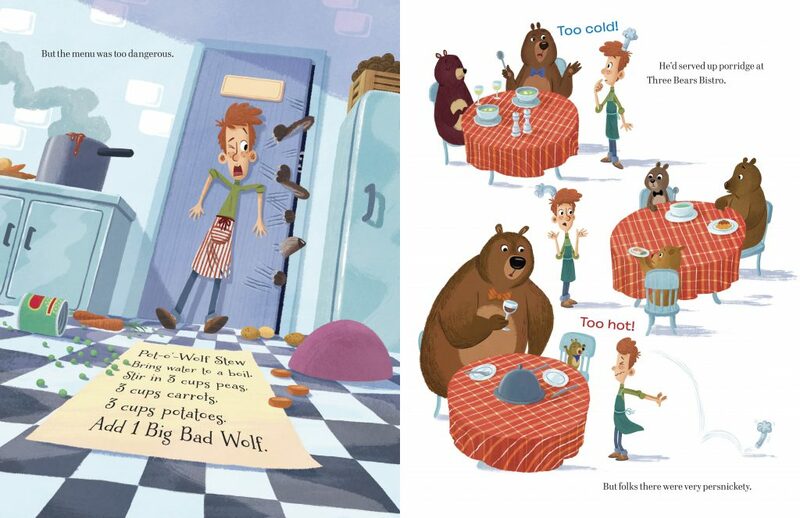 Author Penny Parker Klostermann and illustrator Ben Mantle add just the right ingredients to A Cooked-Up Fairy Tale, a fractured fairy tale that spices up some of our favorite classics. The story takes place in “the magical land of fairy tales” where our hero, William, resides. Though it may seem like the perfect place to live, something is missing for William: an outlet to express his culinary artistry. In his endeavor to make his dream come true, he works as a chef in local restaurants, The Brick House and The Bears Bistro; but when the work proves far too dangerous and painstaking, respectively, he decides to cook from his own kitchen. 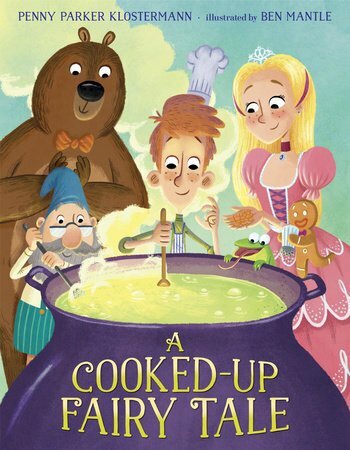 With just a few coins left in his cookie jar, he heads out to the marketplace and purchases what he thinks are ordinary ingredients: raw apples, beans, and a pumpkin—items central to the plot of three specific fairy tales. These items are intended for delivery to Fairy Tale Headquarters. Convinced that Fairy Tale Headquarters simply “needs a good chef to spice things up,” William transforms each item into an exquisite dish and heads off to deliver them to their intended destination. 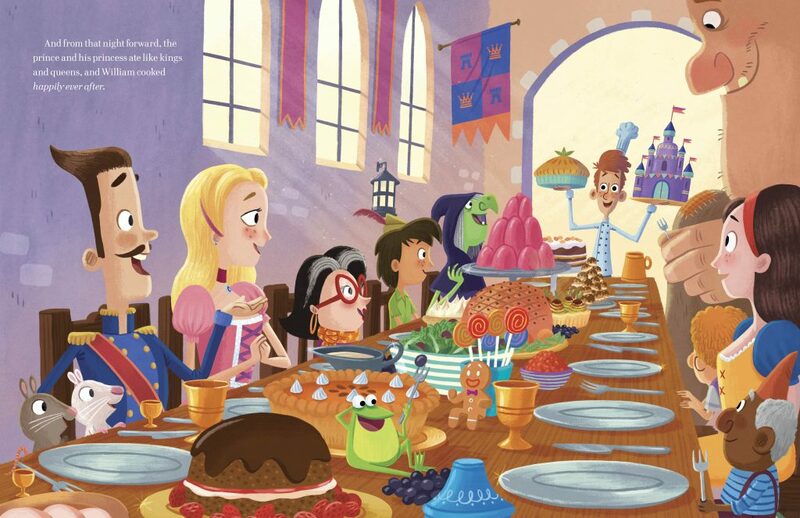 Interior spread from A Cooked-Up Fairy Tale by Penny Parker Klostermann with illustrations by Ben Mantle, Random House BYR ©2017. But William soon discovers his creations pose a possible threat to the children’s bedtime tales. His delicious creations are recreating the endings. Fortunately and most pleasantly, his creative flare produces an even more “happily ever after” than the original story lines. A Cooked-Up Fairy Tale isn’t the usual fractured fairy tale in which a single tale is twisted, altered, or updated in some way. William is a unique character living in the land of familiar fairy tales. Klostermann’s frame technique draws us into the story of our hero who unintentionally disrupts the familiar, immerses himself into these stories, and ultimately becomes part of one. Children will get a kick out of the creative and comical changes that take place in the plot. I can imagine them laughing out loud about what “should” have happened. Mantle’s illustrations delightfully blend the familiar and unfamiliar as well. Vertical lines move the plot along in an energetic and steady direction. At the same time, Mantle’s soft color palette creates a comfortable, safe and calm tone, and his curved drawings sprinkle in the fun. I would recommend this book to children who enjoy lighthearted, wacky tales and to parents/caregivers who enjoy reading stories that celebrate creativity and individuality. The book’s underlying message of how our creative endeavors give us agency to write our own stories is something I truly appreciate and admire.